MSP 20/20 And 5 ways to win Talent with skills in demand.MSP 20/20 And 5 ways to win Talent with skills in demand. For a couple of years now there has been a rumour circulating in the recruitment industry that the business model for contingent workforce management, or MSP, is dead. Poor programme adoption rates, evaporating cost savings and supplier ecosystem management often compared to herding cats simply gives credence to its death. Well, we say the MSP is dead – long live the MSP. MSP offerings have continuously evolved since the 90s and industry research suggests three distinct waves: 1. leveraging scale; 2. neutral models; and 3. sourcing for work – all have advanced the capability and maturity of supplier MSP services. We are now ready to breathe life back into the MSP model with a fourth wave of innovation and service excellence. We’re calling this next wave MSP 20/20, with a dual emphasis on getting ready for the year 2020 combined with 20/20 vision and strategy. While MSP 20/20 may not become recognised as an industry standard term, it does describe the innovative and unique perspective on MSP best practice we have at Gibbs Hybrid. 1. Treat talent with skills as consumers. Just as we have B2B & B2C strategies, an outstanding MSP will have a strong Business-to- Candidate strategy. This will focus on candidate targeting across digital channels; content that drives awareness, engagement and motivation; use of social media to establish candidate relationships (CRM), treating candidates as humans (not just CVs); also treats candidates on a shortlist with the same respect we would clients qualified as sales prospects; finally it stands out by providing a great candidate experience. While this makes perfect sense for a Master Vendor MSP, it’s little more difficult to implement with a Vendor Neutral model. A neutral model will require the MSP & Tier 1, even Tier 2, suppliers to work together to optimise the supply ecosystem. For Clients with 20/20 vision they will expect this anyway and rate the MSP as “adequate” or “transactional” if it is missing. 2. Work with partners who specialise. It’s increasingly difficult to find suitable candidates with skills in demand, yet no role can be “hard to fill”. The assumption is that “Niche” roles take too long and cost too much to source. The only way to resolve this is to rid the MSP of generalist suppliers and focus on partners who really know the candidates they speak to, understand the skill market and “un-niche” those roles through specialisation in targeting and retargeting their B2C strategies. The layer cake of MSP, Tier 1, Tier 2 (even Tier 3) suppliers needs to be flipped on its side. Sourcing for candidates is now a much more specialised discipline. The supplier model becomes less about how the procurement function wants to manage the external workforce category and more about how we quickly and efficiently find the best qualified candidates. 3. Move from sourcing for work to marketing for skills. MSP 20/20, at its heart, is about moving away from recruitment sourcing and toward recruitment marketing. MSP & Supplier sourcing specialists now need to be marketing specialists. They know 3 big things: what skills their client is looking for; where to find candidates with the skills; and how to make their sales pitch for the role standout and catch the best talent. Effective recruitment marketing is essential to the success of any MSP, regardless of model. It’s about raising awareness, using influencers, helping candidates understand the client offer, using multiple marketing channels at once, and constantly targeting and retargeting the message. The candidates with the skills a client needs may not be available right now, perhaps they are working for a competitor. How does an MSP convince a good candidate to make the switch? Unless the pitch to the candidate stands out they won’t bite. 4. Get sticky with talent through marketplaces and pipelines. Candidates in a highly competitive job market need to be nurtured and engaged. Marketing strategies that focus on active candidates are missing out on building a relationship with 80% of the total addressable talent marketplace. To get beyond that 20% of active candidates, an MSP needs to turn to pipelining, building talent communities and marketplaces. A good platform or talent pipelining software solution is essential – otherwise a small army of recruiters is needed to constantly engage with candidates. Talent marketplaces should enable candidates to showcase their skills (including soft skills), motivation and role preferences – allowing for better matching of roles and avoiding pointless conversations between recruiter and candidate. This sounds a lot like Contingent-RPO and to an extent it is. But more than that, it’s about the MSP and supply base creating high quality talent pools and pipelines that are ready for a contingent-RPO, or an MSP deal and not built retrospectively and from the bottom-up. 5. Revolutionise your workflow with the power of data, automation & great CX. No article on innovation for talent sourcing would be complete without reference to better use of data! But any serious MSP or Staffing Supplier will have an Applicant Tracking Solution (ATS) with all the data they need to track work orders, candidates, short lists, offers etc. The focus for MSP20/20 is automation of workflow – eliminating spreadsheets, emails and unnecessary process steps. An effective workflow and automation initiative can provide higher engagement rates with candidates, fast-track candidates from initial awareness of the role to a shortlist, and build much more effective recruiters who reduce time to fill and increase quality of hire. Providing great candidate experience (CX) all along the hiring manager/recruiter/candidate journey is essential. After all, our Business-to-Candidate strategy calls for initiatives that build loyalty, turn candidates into positive influencers and ambassadors, and increase referral rates to other suitable candidates we might have missed. MSP 20/20 is a big topic but, in our view, starting with a new mindset of moving away from sourcing for work and towards marketing for skills, coupled with treating candidates as consumers, will go a long way to provide a much more compelling ROI for this type of business process outsourcing. 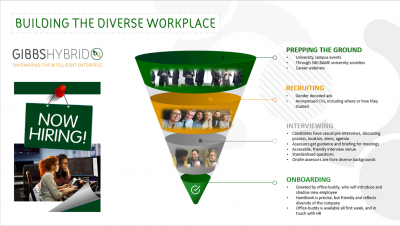 Visit here for more information on Gibbs Hybrid Talent Sourcing solutions.